Between King Francis of France and Pope Leo X. France controls the French Catholic Church. She ruled for her sons. Tried to be a politique; wasn't very good at it as she would attempt to kill people who weren't Catholic. Catherine attempted to have Huguenots killed at the wedding of Henry of Bourbon. Led to Henry's first religious flip-flop. Kinda killed Catherine's politique thing. The Pope was really psyched when he heard about this and in typical popely fashion, gave the messenger a big bag o' gold upon the reception of these tidings. "Paris is well worth a Mass." Became Catholic to rule France. Issued the Edict of Nantes which let Huguenots have the right to practice their religion in regions of Huguenot majority. He was much more concerned with the stability of the French state than its religious state. He was killed by a radical Catholic terrorist. Richelieu sends French troops to fight on the Protestant side of the war despite France's Catholic leanings because of Richelieu's belief in the danger of the Hapsburg family to France. France comes out of this war strongest. "I am the State." Awful at economics (I mean he crippled the french economy with the whole Versailles thing), awful at religion (no more tolerance), made all the nobles live at Versailles, an suppressed Huguenism. This was about Calvinists wanting their rights too, to begin with. It becomes a balance of powers thing towards the end. France wins. Madame de Pompadour was his mistress. Rococo was popular during this time period. On continent: Austria and Prussia fight over territory. Off continent: Austria's allies France and Russia fight Britain over colonies. Britannia wins. Ends with the Treaty of Paris in 1763 with nothing really changing in Europe but with Britain getting France's North American colonies. Free speech is really good, Catholic Church is really bad. Social Contract: General Will determines laws and such. Emile: Kids need to be left to their own devices to learn and teachers should just make sure that the kids don't hurt themselves. Meshuginah, married to Marie Antoinette whom the French hated due to her rampant spending. Executed under charges of treason. The French helped the American colonists gain their independence from the British Empire mainly due to their desire for vengeance following their defeat in the Seven Years War. Unfortunately, French involvement in the war bankrupted the French government and forced hard economic times upon the people of France. Abbe Sieyes wrote on how the members of the Third Estate were the true French people and that they should have a say in their government and so on and so on... Assignats existed as the new paper currency and were backed up by Church lands. The church itself was severely oppressed with the radicals attempting to bring it completely under their heel (note: this will REALLY piss of the peasantry). Also, a Constitution was passed in 1791 which made France a constitutional monarchy. Louis is killed, therefore a constitutional monarchy just will no longer work. National Convention is set up. The Committee of Public Safety is formed with Robespierre as its head. They start killing lots o' people in the "Reign of Terror." 3 goals: Restoration of the Monarchs of Europe, Compensation for the victorious powers, and the maintenance of the Balance of Powers so as to prevent any more major wars. France's head-honcho there was Tallyrand and, all-in-all, France was treated fairly leniently, even after the 100 Days, so as to maintain the Balance of Powers. Conservative guy, issued the July Ordinances which got rid of the Chamber of Deputies, cut off the number of people who could vote, and reigned in the press. So the French, in typical French fashion, tried to kill him. The Parisians revolted against Charles X, blockaded the streets, and then tried to fight the power and stick it to the man. The Citizen King or the Orlean Monarch. He actually did some good stuff like broaden voting rights and bring the Tri-color back. However, he left the urban worker kinda out in the cold and this would lead to the February Revolution. People revolted against Louis Philippe. Provisional government took over. Louis Blanc starts his whole workshops thing. Louis Blanc, an utopian socialist, tries to institute National workshops. Their ends up being no work for the workshops to do so they just start handing out money. This doesn't work and the workshops have to close leading to more violent insurrections. We got a socialistic Republic in France in which all men can vote and they're lead by a guy with the names Louis, Napoleon, and Bonaparte. Seriously, what could possibly go wrong!?!? People dislike having the National Workshops close so the revolt again... -____- Eventually a new republic took over. Louis XIII turned power over to Cardinal Richelieu who fought against the Hapsburg in the 30 Years War, He decreased the power of the nobility by banning their luxurious lifestyle, and he took away the fortifications of the Huguenot cities. Catholicism is allowed in France again!!! White males get rights and can have fun, just not in labor unions and such! No European trade with Britain. Actually helped Britain by increasing its black market sales to the mainland and hurt Napoleon, who had to enforce it. (This is the web address for my picture. It's a very nice picture which excellently details Napoleon's Empire, but you will have to take my word for it). Spanish Ulcer which bogged down Napoleon's army in brutal guerrilla warfare. This was a big defeat for Napoleon who lost a very large amount of his soldiers in an awful retreat during the Russian winter. Morale of the story: Invade Russia in about late March if you really have to. After being exiled by his enemies, Napoleon returns to rule France for 100 days (or as I call it: Napoleon! The Sequel), but unfortunately gets kicked out again by the British and the Prussians at the Battle of Waterloo. He brought the words to the people and when the people read them they got pissed and started revolting against Catholicism. One is saved only through faith; Sola Fidei! Also, everyone is a priest and is responsible for learning about their religion. Finally, while he was liberal in religious matter, he was fairly conservative in political matters. He got a lot of land from his Spanish and German grandparents. He was known as the Universal Monarch. After he abdicated, he gave his French holdings to his son and his German holdings to his brother. Tried to get Luther to recant. He wouldn't. So they tried to have him arrested, but failed. The Peasants utilized Luther's teachings to claim that they were equal to the nobility. However, Luther said they were only equal religiously and not politically. He then urged the nobles to put the peasants to thee sword. Started the Reformation. Ends some bad stuff and starts some good stuff. Helps to prevent everyone from converting to Protestantism. League of Augsburg (Protestant) fought Catholic princes (-____-). Ended in the Peace of Augsburg. You can be Lutheran or Catholic depending on your leader's preferences. Cuius regio, eius religio. Started as Protestants vs. Catholics. With Spain fighting Sweden, the German States, and, ironically, Catholic France (to be fair, they really hated the Hapsburg family). Not religious at the end. Calvinists can now be Calvinists too. Then the Netherlands got their independence. Poland got split up between Prussia, Austria, and Russia. OBSESSED with soldiers (hence, The Soldier King). Made Prussia really militaristic. Starts beuracracy, ends serfdom, etc... Ignores Pragmatic Sanction and goes for Austrian Silesia. Prussia vs. Austria. As Maria Theresa still ruled Austria at the end of this she obviously won, however she did lose Silesia to Prussia, which is what Prussia wanted to begin with. So, arguably Prussia also won. Prussia+allies vs. Austria+allies. Fought over territory. Britain wins. Helped bring up German nationalistic stirrings. Also helped introduce that whole German unification thing. Wrote "Encyclopedia of Philosophical Sciences." Believes that all of history is a series of conflicts between a system and its polar opposite, with the resolution of one fight eventually facing its own opposite later. Democratically elected representatives offer crown of Germany to Frederick William IV, who rejects it because it comes from the gutter and not from the hands of the nobility. Should a unified Germany include or not include Austria. This is important because it affects the Balance of Powers issue. If Austria is included, the new country will be way to powerful. People had to work for the state for a certain amount of time during the week as a land tax. The Ottomans attack Austria and Poland comes to save the day. Issued the Pragmatic Sanction so his daughter could get the Austrian throne. Austria+allies vs. Prussia+allies. Fought over territory in Europe between Austria and Prussia. Ironically, Britain wins. Mother was Maria Theresa, he let Jews actually live, people didn't have to work as much, Church couldn't communicate directly with Pope. All failed after his death. Correct. Vienna was the center for European music. Metternich System: all the big countries get together in an alliance and try really hard not to kill each other. Carlsbad Decrees: Metternich: "Hey guys! Just had a great idea! Lets take away European civil liberties! What could possibly go wrong?! Concert of Europe: Lets talk instead of kill each other. People want RIGHTS?! The government flees for a little while, but then the Austrian army goes in and kills everyone. This began in Florence, Italy. The Medici family ruled Florence, specifically Lorenzo de Medici, who controlled the governmental body. They got all of their money from banking. He was the son of Pope Alexander VI and tried to unite Italy. Was admired my Machiavelli due to his ruthless ruling style. He controlled Florence from behind the scenes, was a huge patron of the arts, and was insanely rich. This is a new focus on human pursuits such as history, art, and such. People are starting to think that maybe humans aren't completely evil. Italy in the Renaissance was a collection of different city-states each with their own government. He got Florence to give up all their art and fun because he thought they were evil. At first the people of Florence supported him, but then they realized that they were no longer having fun so they killed him. This occurred in Rome, where all of the artists eventually went for employment. Wrote The Prince, which says it is better to be feared than loved. France invaded Italy and the Renaissance ended. Wrote The Book of the Courtier, which tells people how to be an ideal Renaissance man. Wrote Dialogue Concerning the Two Chief World Systems. He supported a heliocentric view of the Solar System. He was almost excommunicated for this but repented after pressure from the Roman Inquisition. Wrote On crime and Punishment. concerned the treatment of prisoners. Restitutions for the victor, Balance of powers, and reestablishment of the old monarchies. A lot of Northern Italy was given to Austria. This was the push to unify the Italian Peninsula. 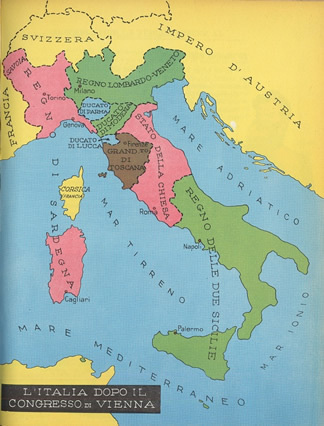 Young Italy, Sardinians, Neo-Guelfs wanted unification. The French came in and ruined everything for the Italians after they had established their republic in Rome (just like the Renaissance). He was an Italian politician who worked for Italian unification and was associated with the Young Italy movement.